Awwwwww! GoDaddy unveiled the puppy featured in the GoDaddy Super Bowl 2015 ad. As GoDaddy Super Bowl 2015 ad will star a puppy. Today GoDaddy presented the puppy who will star together with Danica Patrick in the GoDaddy Super Bowl 2015 ad. GoDaddy says that the little cute puppy has an unproven talent, though he's demonstrated a dynamic chemistry with the camera at the young age of just nine-weeks and that's what landed the coveted Super Bowl role. GoDaddy's little Super Bowl puppy has no name yet. You can help GoDaddy find a great name for the puppy on Twitter with the hashtag #GoDaddyPuppy before filming of the GoDaddy Super Bowl 2015 commercial starts this Thursday. The GoDaddy puppy name is set to be announced Thursday morning at 10 a.m. ET, just before the director calls "action." Check Twitter Thursday morning to learn whether your suggestion is headed to the world's largest advertising stage. "We've had a lot of fun brainstorming ideas and we've even registered a few domain names for the little guy, but we just haven't landed on one we think is just right, so we thought, why not see what the public can come up with for our little 10 pounds of cute," said GoDaddy CMO Barb Rechterman. Danica Patrick, who has been in more Super Bowl ads than any celebrity in history, has had some naming ideas that including Harry and Ranger. "The first time I saw him was in an email photo I shared with a few friends and we all just said the same thing ... 'AWWWWWW!'" Danica has a puppy of her own named Dallas who has her own Twitter handle. "I'm confident I can talk our GoDaddy puppy into social media too." 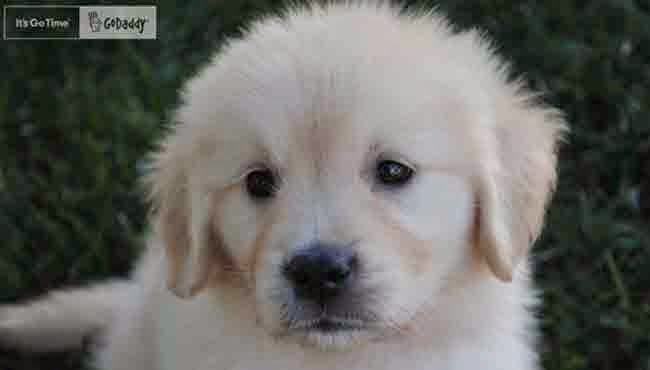 The GoDaddy puppy is a male Golden Retriever was born in California in early October and has five siblings. He's being trained by a Hollywood trainer who has worked with on-screen ducks, cows, squirrels and yes, dogs over the years. The GoDaddy puppy can "sit" and "stay" already, but is working on a much richer repertoire for his two-day on-location shoot outside Los Angeles. The GoDaddy Super Bowl 2015 ad is called "Journey Home" and will reflect the journey of a small business owner. GoDaddy is not revealing plot specifics, but promises the commercial will be unpredictable and twist conventional Super Bowl advertising in a way that speaks to how GoDaddy helps make small business owners' lives better by way of easy-to-use technology. Our partner I4U News will again bring you full coverage of the Super Bowl 2015 Ads. The Super Bowl 2015 will take place on February 1, 2015 in Arizona. The Super Bowl XLIX game will be played in the University of Phoenix Stadium in Glendale. NBC is broadcasting the Super Bowl 2015. The Super Bowl 2015 Halftime Show will be performed by Katy Perry.